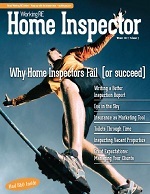 Editor’s Note: This survival guide for home inspectors provides valuable advice for anyone in business today. If the connection between naturalist Charles Darwin’s theory of natural selection and your business isn’t obvious, it should be: in tough times only the strong make it – survival of the fittest. Survival of the fittest in this business environment depends on several things, including how badly one wants to remain in this profession and how well one can “reproduce” success. Many inspectors join the ranks during a healthy real estate market and its attendant opportunities, not because it’s who they are and what they want to do for the next 30-plus years of their life. If you’re an inspector to-the-core, then your survival instincts and practices must be in high-gear now or you’ll wind up on the next round of TV’s Bankruptcy Court. How to proceed depends on your present locale, disposition and current business climate, not to mention your ability to tread water! Not all markets are created equal. If I’ve learned anything in my lifetime, it’s that my business career, and overall success, rest in my own hands and that I have to chart a course that produces and reproduces success for me. Just like politics and real-estate, business success is local. What works for me, isn’t going to work for everyone else. Las Vegas, Nevada, where I live, isn’t Murfreesboro, Tennessee! Sure, there are guidelines and programs at every turn to assist and inform but the bottom line is the ability of the small business owner to pursue, adapt and chart a successful course over the long-haul. 1) I got out of my commercial office space and now have a home-office. This strategy is self-explanatory. Failure to reduce business overhead in economic downturns is one of the largest coffin-nails in the death of a business, outranked only by lack of adequate operating capital. 2) I’ve gone paperless with my reports. My prices haven’t dropped but it chops significant dollars off each transaction to go paperless. I can give clients a printed report if they want but they pay more. So far, 95 percent of my clients go with the paperless-email-version. It’s my observation that older clients who may not be computer-literate prefer the hard-copy, so I keep that option open. 3) I got rid of my traditional business telephone line, which cost me about $65 a month and got an Internet service provider which I run through my computer’s broadband connection. After purchasing their equipment ($39.95) I paid $50 for five year’s worth of service. No more fees to pay for phone and fax until 2013! I saved big on this one! 4) I am not locked into just one reporting format or system. I have designed several of my own residential and commercial reports using Microsoft Publisher, Excel and Word. Versatility and adaptability with my reporting systems allows me to tailor each report to my client’s needs. 5) I’ve added a mileage charge for inspections outside the 10-mile radius from my office. 6) I do all my own desktop publishing. I design and produce my own business cards, brochures, letterhead etc. 7) I am doing more outsourced consulting and CM/CA (construction management and contract administration) for select general contracting and development firms. I have the software and the ability to do CPM-scheduling, building cost-estimates and pro-forma budgeting and I can fit the work into and around my inspection business schedule. I have worked in the construction industry my entire adult life and have extensive experience that qualifies me to perform these outsourced services for smaller contractors who may not have the staff or the in-house expertise and therefore seek to have the work outsourced. 8) I am doing more legal expert witness work. I’ve been networking with my contacts and have substantially ramped up my expert witness work in the last 24 months. NOTE: I am not a hired-gun! I only accept assignments if the client’s case has merit in my eyes. Some of my work is helping attorneys defend home inspectors from frivolous lawsuits. I enjoy this work so much I’d almost do it for free! Almost…! 9) I network with as many active inspectors as I can and let them know I want more commercial inspections. Most inspectors aren’t qualified to do this kind of work but I am, so they refer a fair amount of work my way when they’re approached to do a commercial inspection and they’re not qualified or comfortable with the scope of work because of size or complexity. 10) I sell each home-seller on me and my services while I’m in their home doing a pre-purchase inspection for my client, regardless of whether they’re staying in town or not. If they are staying in town, then I’m quite often the inspector for their new home. On the other hand, I’ve actually had referrals from people who have moved away and met people moving here to Las Vegas! Go figure! I’ve done other things as well but you get the picture. No matter how slow it gets I’m going to be in business until the valley’s empty and someone calls me on my cell phone and says…Turn out the lights on the Strip and lock the door when you leave! As a college instructor I’ve trained hundreds of home inspector candidates over the past 10 years. As a Master Inspector I’ve taken many hundreds with me on ride-along inspections. I’ve told my students time and again to not let home inspections be their sole-source of income. Find or create a niche or niches that only you can fill. One of my students spent many years as a structural concrete subcontractor installing concrete post-tension (PT) slabs. He’s qualified to PT slabs (that use high-tension cables rather than traditional rebar-reinforcements), cracks and failures, so guess what he spends his time doing when he’s not inspecting homes? Maximize your talents and extend your knowledge-base by constantly reading and studying everything you can get your hands on relating to the home inspection business. Don’t let a wasted moment pass by that could be filled with some learning. One last thought before I get back to work. In the final analysis, if you haven’t clearly defined what success means to you, then you’ll never achieve it. Just as you must Map-Quest your home inspection driving routes to arrive at your destination, you must also clearly define your destination and route to success. Here’s what I tell my students: Success is getting what you want. Happiness, is liking what you get. Success without happiness is failure! For some inspectors just being able to continue in business is success. For others, leaving the business to avoid bankruptcy is success. The choices and rewards can be yours but as Tony Robbins says, you’ve got to take action! What are you waiting for? Glenn Curtis is a Master Inspector in Las Vegas, Nevada. As an adjunct and full-time instructor he’s taught construction and home inspection courses at the local community college for 20 years and has spoken at State and National Home Inspection Conferences and Conventions from Las Vegas to North Carolina and points in between. He’s been married to Tammy for 29 years and they have 6 kids and 30 horses. He’s also three-time National Taekwondo champion Black-belt.